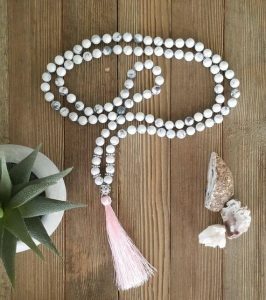 A mala is a beautiful reminder of a spiritual journey and connection to consciousness. A mala is a string of beads traditionally used during meditation practice to focus awareness on mantra and intention. This beautiful string of beads can be a symbol for your spiritual practice & has been used by yogi’s for thousands of years. The term ‘mala’ in Sanskrit is translated as “meditation garland”. Many yogi’s wear malas around their neck, like a piece of jewelry or store their mala in a sacred space in their home. In this workshop, you will create your own mala necklace using howlite beads. You will learn about the history of a mala, it’s tradition and the importance of honoring the culture. You will learn how to care for your mala and how to introduce mala into your personal meditation practice. You will also learn about the healing properties of howlite and the significance of 108 beads. Malas are also worn as bracelets, which is what we will be making. The bead count is a multiple of 9, typically made with 18, 27, or 54. This course will conclude with activating your mala. If you haven’t already, this is your opportunity to make a personal intention for the New Year. Then we will practice a short meditation using your new mantra and mala. This course can be a perfect addition for those beginning a meditation practice or anyone who already has a meditation practice of their own. It’s also great for those who wish to learn more about yoga philosophy, or anyone who simply enjoys the art of making something by hand. Registration is required. Space is limited. No experience is necessary. If you attended the last mala workshop, you are welcome to come and re-string your mala. We’ve learned some things since then and have better string. If you attended the Kundalini Sadhana all 10 days at the studio, then the workshop is FREE. If you participated but didn’t make it to the studio all 10 days then you are offered a discounted price. Please sign-up through Veazey or another teacher if this is you. We’re excited to announce Teacher Training for 2019 is now enrolling. Click here to read more information about Veazey’s Spring/Summer session that ends with a retreat to Bali, Indonesia! A Work In Progress gift certificates are available for purchase in the studio. They can be used to pay for single classes, workshops, and merchandise within one year of the purchase date. While we don’t recommend gift certificates to pay for memberships, we can make exceptions if you ask nicely. When you shop on Amazon this holiday season, head over to Smile.Amazon.com using your regular account details and Amazon will donate to A Work In Progress just because you shopped at the “smile” site instead of amazon’s usual site or app. You can do this year round, but if you plan to make some purchases, remember to use Smile and share the love with AWIP. Make sure you tell Amazon Smile which non-profit you are supporting before making your purchases. 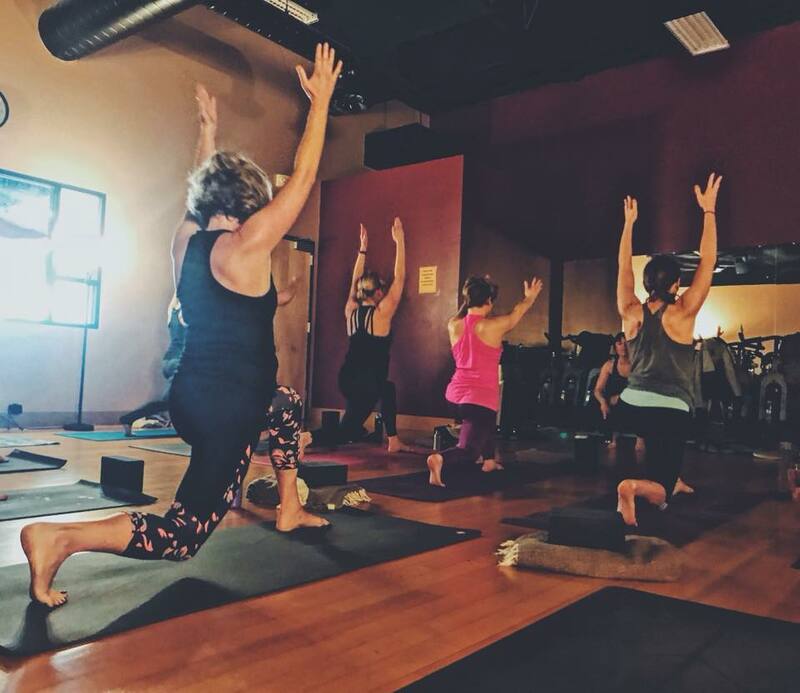 Have the words “I need to get to yoga” crossed your mind? What do you want from you? Write on our Accountability wall stating your attendance goal for the month. Say it out loud. This is what I want to do. For me. And then proceed the rest of the month doing it! Mark your classes as you go on our chalkboard at the studio. Each and every one of us is accountable for ourselves. This is for you, by you. It’s all about accountability.